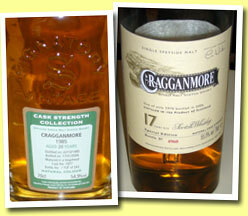 Cragganmore 20 yo 1985/2006 (54.9%, Signatory, hogshead #1877, 242 bottles) Colour: pale straw. Nose: a powerful, rather coffeeish and slightly woody start but it’s soon to get much fruitier, on lots of gooseberries, fresh strawberries and apples. Great balance at this stage. Gets then more flowery (violets, lilies) with also ‘funny’ hints of ham, a little paraffin, fresh almonds and notes of varnish and vanilla. It was a little neutral at the beginning but it developed very nicely. A ‘natural’ malt, no peat - no sherry and little wood. Mouth: punchy, sweet with a very interesting attack on olive oil and quite some salt (unusual here). The tannins are present but they are of the silky kind. Gets slightly bitterish (apple and walnut skin, tea)… Goes on with notes of liquorice stick, rocket salad, a little pepper… Quite austere and sharp in fact and maybe a tad difficult now but I like the profile. Long, liquoricy finish, with also some apple compote and a little grapefruit. Very decent and ‘honest’, for sure. 84 points. Cragganmore 17 yo 1988/2006 (55.5%, OB, 5970 bottles) Colour: pale straw. Nose: again a very coffeeish start (even more than with the Signatory) but developing more on caramel crème, vanilla crème and then ultra-huge notes of marzipan (I think it’s the first time I come across such strong notes, even in marzipan ;-)) Nice oaky tones, cider apples, praline, herbal tea… Probably more wood influence but the whole is just as ‘natural’ as the Signatory. For true whisky lovers. Mouth: just as powerful as the Signatory but rounder and much more on caramel and praline, mocha, milk chocolate, vanilla crème… Goes on with cooked apples, a little pear juice, fresh almonds… Very creamy, almost thick. I like it. Finish: long again, with the tannins coming through now together with quite some liquorice, black pepper and a little dry sherry (even if there probably isn’t any). An excellent, vigorous and… err, natural expression. 86 points. Closed: In 1996. Silent in April 1992, dismantled in 1997 however the warehouses survived until 1999 when they were demolished. Operational Owner: 1957 MacNab Distillers Ltd. 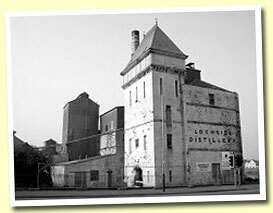 In 1957 Lochside Distillery was converted from an old Deuchars Brewery at Montrose by Joseph Hobbs (MacNab Distillers) and was initially fitted with one patent still and later four pots stills. The name of Joseph Hobbs is generally associated with Ben Nevis Distillery in Fort William but his name is also associated with many distilleries around Scotland. In 1931 Hobbs returned from Canada after losing a great deal of money in the depression of the time and commenced the buying up malt distilleries. In 1937 he bought Bruichladdich distillery on Islay from Harvey family, so ending that family’s long connection with the industry. In association with Train & McIntyre, a Glasgow firm of wine and spirit merchants owned by National Distillers of America, he purchased Glenury Royal Distillery in 1936, Glenkinchie Distillery in 1937 and North Esk Distillery (also known as Highland Esk, Montrose, Glenesk and Hillside Distillery) in 1938. The distilleries were transferred to a wholly owned subsidiary of Train & McIntyre, Associated Scottish Distillers Ltd. and Train & MacIntyre brought the Strathdee distillery, Aberdeen into the group, and added Fettercairn and Benromach in 1938. The conversion of North Esk into Montrose Grain Distillery made the group fully integrated. Hobbs re-equipped North Esk distillery to produce grain whisky and renamed it Montrose Distillery (in 1954 they sold it to the Distillers Company Limited who then transferred it to Scottish Malt Distillers in 1964 who converted it back to a malt distillery). The convoluted world of the whisky business. James Deuchars were the producers of Newcastle Brown Ale and the Montrose brewery was originally built in the 1760’s and operated as a brewery until the 1950’s. James Deuchar purchased the brewery in 1833 and Charles Doig, the famous distillery architect, designed some of the newer brewery buildings in the style of breweries in Germany & Belgium. The tower, in the Bauhaus design style, housed equipment to start the brewing process and the finished beer was housed on the lowest floor. The finished beer was sold in pubs in the Tyneside markets in Newcastle. “Beeries”, the ships used to transport the beer to the Newcastle area, were loaded at the Montrose docks and this practice continued until 1956. That year Scottish & Newcastle Breweries bought Lochside and shut it down moving all operations to Edinburgh. In 1957, Joseph Hobbs through MacNab Distillers bought Lochside with an eye towards its potential to produce grain whisky and this it did until 1961. When the much larger Invergordon grain distillery was built Joseph Hobbs realized that Lochside could not effectively compete against such a large rival so he had some of the brewing equipment converted to four Pot Stills and thus Lochside produced both grain and malt whisky. Further, Hobbs had these two whiskies ‘blended at birth’ (a practice he also used at Ben Nevis Distillery) where both grain and malt whisky are married together and then put into the cask for maturation (2). 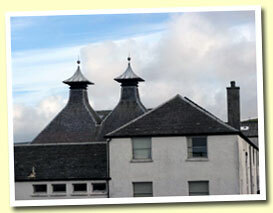 The whisky produced at Lochside contributed to the blend, Sandy MacNab’s. The Coffey still was 67 feet tall and was mothballed in 1970 after the founder, Joseph Hobbs who died in 1964. However the mothballed Coffey still was not removed until later (3). Unusually the distillery had a bottling plant on site. Hobbs named his company MacNab Distilleries Ltd after John MacNab, the owner of Glenmavis Distillery at Bathgate (to the west of Edinburgh) from whom Hobbs had purchased MacNab’s brand names. From 1855 until its closure in 1910 Glenmavis used a Coffey still to make malt whisky and this unusual set up piqued Hobbs’s interest. This seems to have been the impetuous for Hobbs to install Coffey stills at Lochside and Ben Nevis (4). 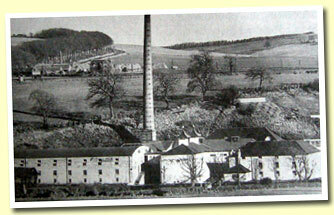 Due to the success of the whisky (high sales) the company became part of Allied Distillers in 1992. Production of Lochside single malt ended in June of the same year, and the remaining cases of whisky were then sold until all stocks were depleted in 1996. At that time the distillery was closed and the remaining staff were made redundant. The distillery had one cast iron mash tun and nine stainless steel washbacks. Both the mash tun and wash-backs were without covers . The stills were very similarly designed with lyne arms that have a slight downward angle, and somewhat tall thin necks that form the traditional onion shape where it joins the shoulders of the stills. The spirit was then aged in bourbon casks. The last manager was named Charles Sharpe and Elizabeth Riley Bell interviewed him for her article which appears in the Scotch Malt Whisky Society archives. (1) The Scotch Whisky Industry Record by H Charles Craig indicates a date of 1958. The Making of Scotch Whisky Moss & Hume indicates a date of 1957. (8) I cannot place this quote from my reference library, apologies to the author! MUSIC – Recommended listening: a good, rather oriental and 60's influenced piece by Frenchman Julien Ribot called Autre part est un lieu sans histoire.mp3. 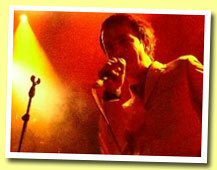 Please buy Julien Ribot's music if you can get it where you live. 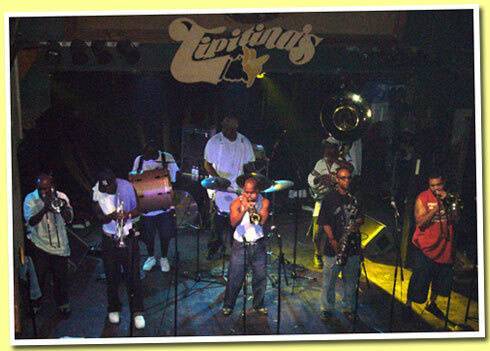 No one is stumbling at the world famous Tipitina’s (well, not when we arrive), the club founded by Professor Longhair, named after his 1953 chart success. It’s a barn of a place, with a high ceiling and balcony overlooking a capacious stage. But the place fills up quickly with a mostly youngish, mostly local, mostly polite and friendly and mostly white crowd. First on stage are Yo Mama’s Big Fat Booty Band, from Asheville in North Carolina, a versatile seven-piece band who are for the most part far more entertaining than their name might suggest (yes, I know it’s ironic, but I was once told that Americans ‘don’t do ironic’). It’s their first time in New Orleans and they’re as pleased to be here as we are. Actually there are almost eight of them as they have an occasional singer, Suzanna Baum, who I guess might be somebody’s girlfriend, but who, to be frank, adds little to the action on stage. Far more interesting is Lowell George school guitarist John Paul Miller, the Bootsy Collins-obsessed bass and trombone player Al Al Ingram (nice hat Al Al!) and the accomplished two man brass section of trombonist Derrick Johnson and saxophonist Greg Hollowell, who looked as though he was bunking off from accountancy school and was worried he might get found out. Miller, Ingram, guitarist Grady Gilbert and percussionist, vocalist and guitarist Josh Phillips (a dead ringer for John Belushi in his sloppy beach pants and ‘California’ hat) swap instruments at a bewildering rate and display a serious proficiency on everything they play – despite appearances to the contrary this is sophisticated stuff. The result is apparently ‘Bounce Music’ – now it may be lacking in substance (just how many songs about ‘Booty’ can you have? 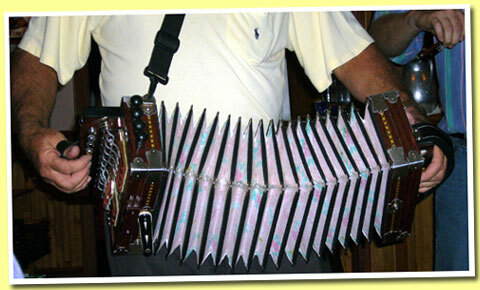 ), but it’s fierce, funky, infectious and fun. Apparently they’ve been working for three years with only a home-made live album to show for it – well compared to much of the dross we get served up on plastic these days they deserve better – and should you get the chance, well go and see them. You might have thought that the Rebirth Brass Band had been named to capture this particular moment in the City’s history – in fact they were founded in 1983 by still present tuba player Philip Frazier, whose solid playing gives the band the firm foundation on which it builds a remarkably pulsating and funky (sorry – but it is New Orleans) groove. 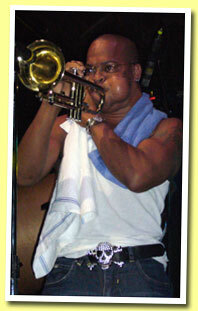 Think the Dirty Dozen Brass Band with a bit more attitude, a little bit more aggression. Apparently all of the band were forced to leave the city after the storm and floods but they’ve slowly drifted back – and I’ve no doubt their name now has added meaning for them all. They take the stage ponderously in ones and twos – we have the eight man version of the band - weaving their way through a forest of microphones before, about ten minutes later, they’re all finally in place. Tuba, bass and snare drum to the rear, two trombones, two trumpets and saxophone. Quite why they needed the mikes I don’t know – it’s the sort of loud that would make Motorhead’s Lemmy weep with delight, and my ears are ringing brass band the following morning. I wouldn’t even begin to concoct a set list – it was almost too noisy to hear – but I did recognise ‘It’s all over now’, “I feel like funkin’ it up’, ‘You don’t want to go to war’ and ‘Fever’ – but don’t quote me on that. This was less about knowing the tunes than feeling the music, which was hard not to do with such a pulsating rhythm section and monstrously visceral playing, particularly from trumpeters Glen Andrews and the showboating Derrick Shezbie (who apparently joined the band when he was only ten). Party music, party time. The crowd loved it. Many thanks and welcome back Nick and Kate! 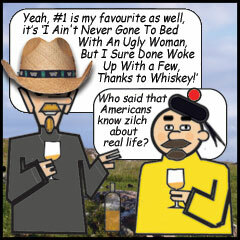 I'm wondering what would have happened if old Nap hadn't sold Louisiana to the Americans for $15,000,000 in 1803... Not even the price of a good Scottish distillery! Now, as for music, we have lots of nice tunes on these bands' myspace pages (myspace, again! 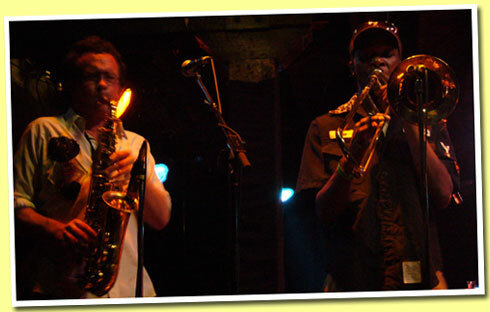 ): Yo Mama’s Big Fat Booty Band - The Rebirth Brass Band.Funky brass rules! All the samples for the Malt Maniacs Awards have now been shipped, including last minute deliveries from Nikka's. India's Krishna seems to be the most advanced taster just now but then again, he's doing his tastings in Amsterdam ;-). The Single Malt TV came to Alsace to shoot the fillings as expected and despite what the picture at the right may suggest (nice grimace Katja! 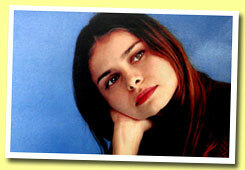 ), lovely - and skilled - reporter Katja Pfitsch managed to survive, and so did cameraman Toni. A shortened version of the coverage should be broadcasted right on September 29 (hey, that's today!) whilst the 'full proof' version will be aired later this year. New distillery profiles to be published shortly on Whiskyfun: Lochside and Tamnavulin by Lawrence Graham, Kinclaith by Davin de Kergommeaux, Mosstowie by Ho-cheng Yao and Littlemill by Thomas Lipka. BenRiach 25 yo (50%, OB, 2006) BenRiach keeps launching new expressions just like Bruichladdich does and even if that can be slightly irritating sometimes, it’s usually for the better so let’s not complain and taste this new 25yo that’s been only partly finished (again a new idea!) as it combines whisky matured in new oak and whisky finished in sherry butts. A winewoodsky, in other words… Hey, why not! Colour: gold. Nose: a rather expressive and unusual start on wood and menthol. Quite some peat as well, of the farmy kind, lots of liquorice, cider apple… Gets then sort of mustardy (horseradish as well?) and then rather animal (cow stable, manure). Rather oaky, dry and not easy-easy at all even if there’s a little candy sugar. Mouth: sweeter now, punchy but also slightly bitter, still quite green and herbal. Touches of salt and vanilla crème but also lots of strong tea, liquorice stick, dried herbs… Gets spicier with quite some green curry, pepper, also chlorophyll chewing-gum, walnut skin… Again a bit hard and bitterish, even if the rather long finish displays a little sweetness now (sultanas, cappuccino, Irish coffee). A certain acridness and dryness in this one, certainly not an easy going vatting. 84 points. BenRiach 30 yo (50%, OB, 2006) Roughly the same trick here: it’s been partly finished in oloroso butts whilst the other part has been fully matured in sherry butts. Colour: pale amber. Nose: shier at first nosing but the overall profile is rather similar, even if it’s probably greener, earthier and even mintier. Lots of freshly crushed mint leaves, apple skin, fresh walnuts and almonds… Hints of sherry but it’s rather whispering. Quite some liquorice again, oak, tea, bay-leaves, bitter oranges, hints of aniseed… Kind of a sharpness and always this dryness… Mouth: starts a little sweeter than the 25 yo and more on mint, eucalyptus and chlorophyll. Huge notes of juniper berries, green tea, chilli, bitter oranges… And lots of wood extracts, bringing again quite some bitterness and dryness. Not quite as difficult as the 25 yo but not far from it. Keeps developing for a while, mostly on lemon marmalade, dried ginger and again radish and mustard plus a little peat (I think). The finish is close to the 25yo’s but even greener and more drying. 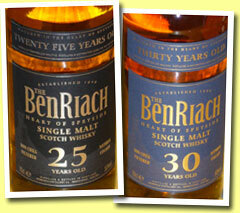 In the same league I’d say – we’ve had many new BenRiachs that were much better for my tastes. 84 points. SHOPPING – If you like marmalade and if you’re not afraid of making yourself ridiculous, you’ll have a unique opportunity to buy a £5,000 jar of Duerr’s marmalade on eBay later this year, containing no less than £3,450 worth of Dalmore 62 yo (as well as £348 worth of 1996 Pol Roger Champagne and £120 of gold leaves – quite cheap, that gold). Very silly if you ask me, and this trick was already very silly in the 80’s, when it was quite popular among marketers. From Cartiered 2cv Citroëns to Louis-Vuittonned Honda motorcycles, not to mention the Danziger Goldwasser, a popular liqueur you can still buy at any liquor shop for 14.95 euros a bottle and that’s been containing gold leaves for… 400 years. Even controlled auction buyers are not something new - amazing that some already know that the unique jar will fetch £5,000 or more, eh!? Ah, that will be reserve price! Glenfiddich 12 yo 'Toasted Oak Reserve' (40%, OB, 2006) This new expression has been matured in first-fill American oak barrels. Colour: gold. Nose: a very toasted start indeed, with quite some caramel, torrefaction, hot roasting peanuts, vanilla crème… Nice balance, with an enjoyable maltiness and good news, no over the top woodiness. Slightly smoky as well, going on with a little earl grey tea and hints of heather honey. Inoffensive and uncomplicated but enjoyable – no need to scratch your head here. Mouth: quite tannic at the attack, tea-ish, caramelly and chocolaty, with maybe a little lack of body. Again quite some roasted nuts but it really reminds me of the new Balvenie 17 yo ‘New Wood’, with a thin middle. Again, I feel 40% ABV is a little too low to stand a rather heavy wood treatment such as new oak or first-fill oak, as if the wood wouldn’t get diluted as properly as all other constituents. Yet, the finish is a little bolder again, unlike the Balvenie’s, and very nutty and caramelly with also faint hints of violet sweets. In short, a very good whisky on the nose and an okay palate lacking a little more body. Still pleasant: 78 points. Glenfiddich 1974/2006 ‘Private Vintage’ (47.3%, OB for La Maison du Whisky, cask #10260, 198 bottles) A new single cask introduced at WhiskyLive Paris. Some aficionados adored it, some remained impervious to its charms… Let’s see. Colour: gold (paler than the Toasted Oak). Nose: of course this is a different league but there is kind of a toastiness at very first nosing, that makes for sort of a receptacle for all the superb aromas that are about to assault your nostrils: roasted nuts but also lots of fruits (mostly very ripe mangos and bananas but also coconuts) and lots of honey, beeswax, pollen… The oak brings a delicate sourness to the whole. Also hints of tobacco (say like a freshly opened pack of Camels) and leather polish, orange juice and whiffs of wood smoke, paprika and soft curry. Really complex and hugely enjoyable, with maybe something slightly feminine (sorry Martine). Mouth: lots happening right at first sip, with again lots of mangos (or rather mango yoghurt), dried pears and orange marmalade. Really full-bodied yet quite delicate but getting then very spicy, on cinnamon, coriander, white pepper… Maybe the wood and its tannins start to take a little too much control after a while, the malt getting slightly too bitter and ‘green’ (un-sugared green tea) but still no big deal. Medium long finish, back on bananas and vanilla plus again quite some green tea and malt… An excellent, classy Glenfiddich, especially on the nose. The palate is just slightly too woody in the middle for my taste but just excellent otherwise. 90 points. MUSIC - Recommended listening - Katell Keineg and The Floors do Love Song To My Guru.mp3. 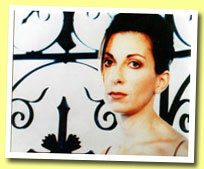 What a great little song - please buy Katell's music! (I'm a fan). Really sharp – great here – and uncompromising, with a ‘nasal finish’ on raw peated barley and wood smoke, with kind of an enjoyable acridness. Very different from its colleagues Uigeadail and 10yo, with no fruits or roundness whatsoever. Maybe the bad boy in the range? Mouth: extremely consistent, just as nicely sharp as the nose suggested. The attack is slightly salty, very lemony and quite peppery, with kind of a greenness (apple skin, green tea, very dry white wine). A tad less smoky than on the nose. Lots of fresh bitter almonds, a little paraffin, strong cough syrup… Petrol (not that I already tried that), grapefruit skin… It’s juts at the rather long finish that a little sweetness comes through (apple compote) together with quite some salt and spices (green curry). Excellently sharp – a great, great surprise, this new Ardbeg! 91 points. 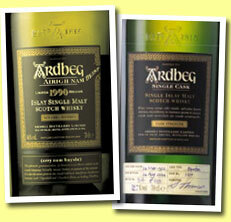 Ardbeg 1974/2006 (52.5%, OB for La Maison du Whisky, cask #3309, 119 bottles) Colour: gold. Nose: an amazingly medicinal start again, but of a different kind: lots of camphor, eucalyptus, embrocations, old turpentine… The development happens on something nuttier (marzipan) and also on fresh butter, vanilla and old walnuts (definitely a fino character, even if it wasn’t a fino cask). Gets slightly resinous after that, toasty and meaty (smoked ham, fried bacon). Finally sandalwood, sour apples and old books, returning to Vicks and smoke. 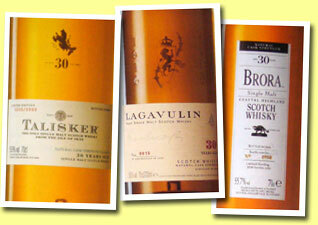 Brilliant as expected – how many of these great casks do ‘they’ still have (whoever the previous owner was)? Mouth: not extremely bold at the attack and slightly cardboardy but that’s not a problem at all because it’s soon to get just as medicinal as on the nose, quite huge and invading. Superb notes of pu-erh tea of the best kind, quite some salt again, fresh walnuts, ‘real’ liquorice Holland-style (I’m about to become an expert, thanks to some Dutch maniac!) cough sweets, old Chartreuse (I’m about to become an expert, thanks to some French maniac), beeswax, chlorophyll… Something definitely ‘old and resinous’, ‘polished’, ‘antique’… Totally irresistible. Finish: long but not monstrous, oily, salty and resinous with hints of big, fat oysters and mussels. Well, this is just another big Ardbeg from the magical years! Quite expensive (roughly 350 euros) but worth every cent if you don’t gulp it like if it was Coke. 94 points. Our friend Yves draws our attention to this incredible new pair of speakers made by Pioneer out of genuine 50 yo white oak barrels from Suntory’s. They are said to make “a surprisingly rich bass sound, maximizing speaker drivers performance, and representing the richness of the music.” It’s true they look nicer than the ugly medium-density fibreboard (MDF) or plain plastic that many mundane speakers are made from… Pioneer even wrote that “the wood from these barrels had a mature mellow tone that when flattened out made a great finished speaker”. A finished speaker? Are they going to finish speakers too!? Anyway, probably the ultimate tool for listening to your favourite drinking song… Model: Pioneer S-A4SPT-PM, $598 a pair in the US, only through pioneer electronics. MUSIC - Recommended listening - there's been lots of fabulous versions of George Gerschwin's Summertime (Janis!) but did you know Bobby Womack's, syncopated Summertime.mp3? Ah, that bass line... 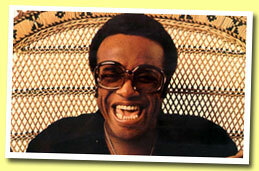 Please buy Bobby Womack's music! Now the more classical old rum and raisins, old cognac, whiffs of menthol, old leather… Quite stunning, with a very long development and something really ‘old fashioned’, like an Agatha Christie novel. Mouth: bold, oily, creamy and maybe a tad drying and tannic at first sip. Whether that comes from the sherry or from the wood, I don’t know. The first descriptor I can come up with is over infused rosehip tea (err…) Okay, let’s make that strong black tea. Then lots of raisins (rather Smyrna or Corinth than sultanas), bitter chocolate, coffee, liquorice, Chinese sweet and sour sauce, blackcurrant liqueur, kumquats… Rather simpler than on the nose I’d say but still very good. Gets quite spicy after that (pepper, cloves, dried ginger), especially at the rather long, slightly drying but otherwise fairly balanced finish. 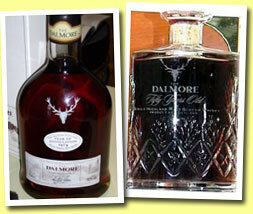 An excellent, punchy and rather heavily sherried Dalmore for long winter evenings. 89 points. MUSIC – Recommended listening: Vanina Michel singing Cable confidentiel.mp3 with Nick's recent discovery Didier Lockwood on the 'electroviolin'. That's on her excellent 'Prévert Inédit' CD. Please buy Vanina Michel's music. Opened and tasted with the Malt Maniacs during the MM Awards 2006 filling party. 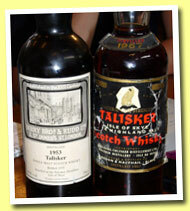 Talisker 1953/1975 (43%, Berry Bros) Colour: gold. Nose: starts quite malty and very nutty, with a lot of presence. Quite some smoke but a rather discreet one at first, and then it grows bolder, together with something superbly animal and resinous as well as quite some lemon balm. Gets then really maritime (sea air, all sorts of shells). A little liquorice. Keeps developing on coal and pine sweets, hints of bitter oranges, a slight old bottle effect and quite some old yellow Chartreuse. Really beautiful! Robert Brown Specially Selected Very Old Scotch Whisky - Same as supplied to H.R.H. The Prince of Wales An amazing whisky and an amazing story. The SS Wallachia, a huge steamship, sank in the Firth of Clyde in September 1895, after having been rammed in the bows by a Norwegian steamer. She had been quietly lying under 34 metres of water since then but sport divers rediscovered her and brought several bottles of this whisky back to the open air. Most books claim that Glenury was founded around 1825 but it first appeared in excise records in January 1833 (duty paid: £2,783) and the distillery was partly founded to provide a market for barley in a period of agricultural depression (like several distilleries on the east coast). The man behind this venture was Captain Robert Barclay (1779-1854), Laird of Ury and MP for Kincardine, who was also quite an athlete. In 1808, he had walked 1,000 miles in 1,000 successive hours and won 16,000 guineas, the equivalent to many millions today. Robert Barclay was also a friend of the queen (whom he was calling ‘Mrs Windsor’), hence the royal suffix that he was allowed to appose to the distillery’s name. In 1847, the distillery was put up for sale and The Aberdeen Journal wrote: “This extensive an very complete Malt Distillery is situated within a mile of the seaport of Stonehaven and fifteen miles south of Aberdeen. It is capable of distilling 120,000 gallons of whisky annually, and in consequence of the perfect system of machinery (all propelled by water) the expense of manual labour is greatly reduced… The whisky produced at the works has long stood in high repute both in the Scotch and English markets”. It’s in 1855, one year after his death, that Barclay’s company sold Glenury-Royal to a certain William Ritchie, who made additions and improvements and increased the distillery’s capacity. William Ritchie & Co decided to close the distillery in 1925, officially for ‘spring cleaning and plant renewal’ but the industry was going through difficult times so Glenury remained inactive for a long time, probably until 1936 when Lord Stonehaven, who had been probably the actual owner for quite some time, sold it to Joseph Hobbs (1890-1963, of Lochside and Ben Nevis fame) on behalf of the National Distillers of America. It was resold to Associated Scottish Distillers for £18,500 in 1938 but ASD did involve both Hobbs and National Distillers of America. Production had officially resumed in 1937 but it stopped again at the beginning of WWII and reopened in 1946. Joseph Hobbs built roads into the distillery, landscaped the site and made Glenury the laboratory for all of ASD’s distilleries. There was a pair of miniature potstills which were used as working models for all kinds of experiments. Glenury-Royal was bought by the D.C.L in 1953 and its subsidiary Scottish Malts Distillers Ltd worked the distillery, the licence going to its subsidiary John Gillon & Co. Glenury-Royal became a component of Gillon’s blends (Ye Auld Toun and King William IV) but they also started to bottle a small proportion of the output as Glenury Royal malt whisky 12yo. The main source of power at the time was a water wheel that was doing almost everything: driving the gearing for the mash tun, the sack hoist and the rummagers in the wash still. There was no steam power and it’s only when the distillery was reconstructed, in 1965-1966, that electric power replaced waterpower. Two new stills were added to the existing pair. On-site malting was stopped in 1968 when almost the whole industry was booming, the brand new Glenesk Maltings now providing the malt. One of the two 19th century maltings became the empty casks store and the other one a filling store. The two kilns that were linking the maltings were demolished in 1979 to improve access for vehicles. Yet, the downturn of the early 1980’s provoked its closure in 1985, but it was probably also down to the inability of the DCL and the local council to come to terms over effluent disposal, often a problem for distilleries occupying unusual sites - the Glenury one was long and narrow, running down to a railway aqueduct, with a burn on one side. The problems arose after the site had been expanded in the 1960s, and as regulations on discharges etc. were tightened. Originally, it’s said that the burn was used as a virtual worm tub. The distillery was emptied in 1987, all casks being shipped to central warehouses, and the buildings were demolished at the turn of the 1990s to give place to a housing estate. Sources: Diageo – with many thanks to Nick Morgan, Scotch Missed (Brian Townsend), The Scottish Whisky Distilleries (Misako Udo), Picture: Glenury-Royal circa 1940 - Diageo Archives. 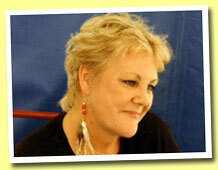 MUSIC – Recommended listening - It's delicate, it's fresh, it's the very excellent British jazz vocalist Carol Kidd singing I'll be tired of you.mp3. Please buy the lady's music and go to her concerts! 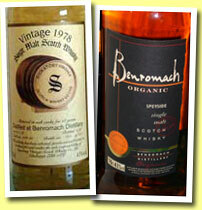 Benromach 18 yo 1978/1996 (43%, Signatory, cask #244-246) Colour: white wine. Nose: a rather powerful, very grainy and malty start with hints of violets and other flowers. Gets then rather mashy and yeasty (porridge), yoghurty before a few fruity notes emerge (apples, hints of pears, green bananas). Something slightly metallic in the background and a faint soapiness but the whole isn’t unpleasant. Strange notes of smoked fish after a while. Mouth: well, things are getting slightly worse now, I’m afraid. The attack is very cardboardy, weirdly orangey (rotting oranges), wrongly medicinal (aspirin)… Gets then quite malty and, again, mashy (stale beer). Well it’s frankly dirty I’d say, and the finish isn’t any better, getting even bitter and oddly salty. What’s sure is that the general level of Signatory’s core range improved dramatically during the last years! 68 points for this one. Benromach ‘Organic’ (43%, OB, 2006) A young whisky matured in new American oak – let’s hope that the later won’t overwhelm its ‘organicness’ ;-) but it’s true that the use of new oak ensures that the end product is 100% organic. Colour: pale gold. Nose: oh, this is ‘different’ indeed. Lots of oak (hot wood that’s just being sawn), hot milk, vanilla and muesli as well as boiled cereals, tapioca, apple juice, cooked pasta, semolina, nutmeg (bold)… Unusual indeed and certainly enjoyable – not only for its difference. I know something ‘organic’ does not taste or smell ‘organic’ as such but here, it does in a certain way. Err, let’s put it this way: it’s really a mixture of ‘natural’ oak and malt. Mouth: rather sweet with again lots of tapioca or semolina spiced up with nutmeg as well as some enjoyable toasty, malty notes. Goes on with roasted nuts, all-vegetal chocolate, hints of ripe strawberries and violet sweets, honeydew, mead… Just as unusual as on the nose. Rather long finish, grassier and maybe slightly cardboardy now but again, the whole is very, very interesting. I do like this for it’s really a new voice and certainly not just a gimmick. All that may be just in my mind but it does taste more ‘natural’ indeed – or is it just the new oak? 85 points. 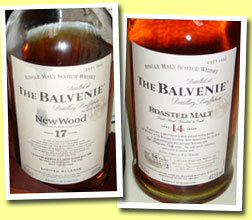 Balvenie 17 yo ‘New Wood’ (40%, OB, 79 casks, 2006) Matured in bourbon barrels and finished in new American oak barrels. Colour: gold. Nose: rather fresh and flowery at first nosing, with quite some wild flowers (buttercups and such) plus freshly cut apples. Develops on vanilla and, indeed, oak but it’s much more ‘shy’ than, say Glenmorangie’s Artisan Cask. Hints of heather. Gets slightly bitter and dry (beer with lots of hops, rubbed orange skin, sawdust). Maybe the 40% are a little too low here, there even kind of soapiness. Mouth: just a little sweeter but rather weak and almost watery at the attack. Curious… Cider apples, white pepper and nutmeg but also cardboard, old walnuts… The whole lacks a little backbone, it seems that the wood absorbed most of the usual Balvenie character. Finish: short and rather weak, yet drying and cardboardy. I’m sure even 43% instead of 40 would have made this one better… This ‘new wood’ trick just didn’t seem to work here, I’m afraid. Well, just my opinion of course. 72 points. Balvenie 14 yo ‘Roasted Malt’ (47.1%, OB, 34 casks, 2006) Made out of malt that’s been dried more heavily than usual and matured in firstfill bourbon. Colour: deep gold. Nose: powerful and slightly spirity at first nosing, with again this kind of dryness that’s quite unusual with Balvenie. Again quite some oak, toasted bread, flour, paper… Rather austere. Something chalky and green (apple skin). Just hints of honey and apricots… Not easy-easy, that’s for sure. Mouth: it’s getting a little better but there’s too much wood again here. Not exactly pencil sharpener juice but we have lots of tannins besides a little coffee (un-sugared) and notes of young rum. It does get better after a few minutes, though, rounder and sweeter (crystallized oranges, black nougat) and rather nicely spicy (cloves, nutmeg, black pepper). Alas, the finish is still quite drying and bitter, with lots of old walnuts. Better than the 17yo but I think Balvenie’s core range is so much better! 78 points. 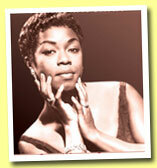 MUSIC – JAZZ (sort of) - Heavily recommended listening: 1954, Sarah Vaughn does Wathever Lola wants.mp3. So funny! And remember, give in, you'll never win, so please buy the great Sassy's music! The Malt Maniacs Awards filling party has started at Domaine Zind Humbrecht in Alsace yesterday with 10 Maniacs coming from all parts of the world (Well, India, Canada and Europe). The 10 Maniacs already had plenty of Domaine Zind Humbrecht wines. All 2005’s are just as stunning as the 2004’s. A tad less dry and a bit rounder. Tasted a Sélection de Grains Nobles Trie Spéciale Clos Jebsal 2002 that will probably send Yquem and Alois Kracher back to school (Serge’s comment ;-). The casks that had contained that Trie Spéciale have been shipped to Bruichladdich, where they already sheltered some great 1970 for a few weeks. If the end result is anywhere near the wine, well… Watch that one. A bunch of great malts tasted by the 10 Maniacs yesterday. Special mention to the Laphroaig 1970/1986 (54%, Duthie for Samaroli, 720 bottles). Proper tasting notes will be posted on WF later. 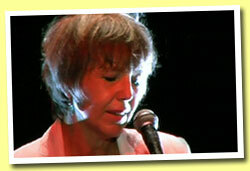 Maniacette Martine Nouet expected to join us today. 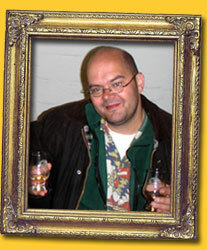 New Single Malt TV will come to Alsace on Saturday to cover the Malt Maniacs Awards fillings. Meanwhile, Dave Broom is preparing an e-pistle on cask seasoning and rejuvenating. Three new distillery profiles to be published shortly on Whiskyfun: Glenury-Royal by Serge, Lochside by Lawrence Graham and Kinclaith by Davin de Kergommeaux. Bowmore 1996/2006 (46%, Berry Bros, 2 casks) The 1993 was so great, we have high expectations now… Colour: white wine (well, almost white). Nose: clean and very maritime at first nosing, not extremely powerful nor matured. Quite fruity (cherries, apples, pears) but getting smokier and smokier as well as sort of milky and vanilled at the same time. Dairy cream. Huge notes of lavender after that but it’s not the dreaded kind of lavender soap here – gets also quite earthy (roots). Super pure, super clean and super fresh, not brilliant but hugely enjoyable. Mouth: powerful and compact, very bittersweet (pepper, lemon skin, liquorice stick, walnut skin). Rather less peaty it seems. Develops on fresh fruits (green apples, lemons, not too ripe kiwis and gooseberries) and gets then frankly grassy and vegetal, with bold notes of green tea, chives… The finish is long but a tad bitter and slightly acrid. Well, I think we could say that’s sharpness. Sharp like a blade indeed, very pure and close to ‘the spirit’. A green Bowmore? 85 points. Distillery No 4, Release No 2 1989/2006 (45%, Gordon & MacPhail for LMDW France, Secret Stills, 610 bottles) Probably that same distillery on the shores of Loch Indaal, close to a round church. Colour: gold. Nose: much more wood influence (it was a remade hogshead) here and much more maturing. Starts on apple skin, cider, smoked tea, butter and develops on notes of cigar box and all sorts of herbal teas as well as soft spices. Again, this one gets smokier with time, and it’s beautiful smoke. Gets then quite mineral and meaty at the same time (coal, smoked ham, flints). Probably more complex than the BBR and more ‘intellectual’. Mouth: quite smoother but certainly not tamed and certainly quite salty. Salted tea with yak butter? Gets quite ‘green’ after that, with again notes of old walnuts, very strong tea, very bitter chocolate (like 90% cocoa), bitter oranges… Quite some smoke of course, green leaves… Gets extremely dry but in a very, very nice way and the finish is long, perfectly smoky and dry, on un-sugared Turkish coffee (with the bits) and hints of mustard. Superbly austere and dry if you like that as much as I do. 87 points. Bowmore 16 yo 1990/2006 (53.8%, OB, sherry matured) A new version after the 1989 from last year – or was it two years ago? Colour: amber. Nose: not that different at very first nosing but then the sherry really starts to come through, with superb notes of ‘yellow’ (fino type), dead leaves, coffee and smoke. Great balance. Then we have the peaty, farmy notes (hay), both smoked and roasted tea (hochicha), with huge and rather unusual notes of smoked sausages arising. Barbecue? Hints of mustard as well, balsamic vinegar, salted liquorice, pipe juice, tar… Luxuriant but full of ‘uprightness’ at the same time. I like it a lot. Mouth: just as rich but alas, some much feared notes of ‘geranium jelly’ shine through. An odd fruitiness that just doesn’t combine well with the peat I think and that we also had in many older ‘pre-Signatory’ Edradours. Luckily, it does improve after a moment, with lots of cocoa, coffee and roasted raisins but that happens probably too late. This palate is far from being a catastrophe but it reminds me of some other Bowmores or heavily sherried Glen Gariochs (1985 anyone?) and their offbeat perfumy notes. But the nose was absolutely fabulous I must say, what a shame. 80 points (because of the stunning nose, obviously). Bowmore 37 yo 1968/2006 (43.4%, OB, bourbon, 708 bottles) Colour: full gold. Nose: starts amazingly fruity just as expected. A genuine fruitbomb in fact, with loads of passion fruits, guavas, pineapples, tangerines, mangos, oranges, pink grapefruits… Also more ‘western’ fruits such as melons… Well, I can’t see how any whisky could be any fruitier than this one, it’s almost an all-fruits concentrate and it’s only when twirling your glass that you get other aromas such as fresh mint leaves, coriander, hints of olive oil and honey. But it’s amazingly rich and, like I said, concentrated. Exceptional. Mouth: extremely good news, there isn’t too much wood but rather another fruity breaker. Citrus first this time (oranges, tangerines), then mangos and passion fruits and finally the rounder, sweeter ones like papayas, guavas, bananas… The oak gives the whole a superb structure, with a little nutmeg, cinnamon and whiter pepper and even if the middle is a bit lazy I’d say, it takes off again after a while and the finish is rather long and perfectly balanced, quite rich again and of course extremely fruity. A fruit salad with lots of cloves and pepper and a spoonful of olive oil, just excellent and hugely drinkable. And tons of cloves at the retro-olfaction. 92 points. 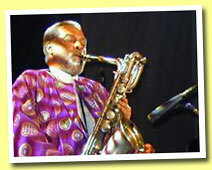 MUSIC – JAZZ - Recommended listening: amazing sound, amazing musicians, amazing rendition of The wind beneath my wings.mp3 by crazy free jazz musicians such as Hamiet Bluiett on baritone sax or gospel great Carol Amba Hawthorne on vocals. A very brilliant, very rough sound! Please buy their music! Caol Ila 10 yo 1996/2006 (46%, Berry Bros - John Milroy, refill hogshead #730, 441 bottles) With this new series, Berry Bros’ excellent Doug McIvor decided to pay tribute to John Milroy with whom he worked before joining BBR. Colour : white wine. Nose: a very maritime start, very ‘classical’, on a full plate of oysters plus quite some smoke (peat of course but also plain wood). Lots of iodine and something slightly medicinal (bandages) that usually belongs more to the south shore of Islay. Crisp and rather beautifully sharp, developing on the more usual green apples and hints of wet stones. Remains very smoky but more on wood, leaves and grass (garden bonfire) than on plain peat. Not too complex but extremely enjoyable. Mouth: probably fruitier and smoother at the attack, sort of tamed, then develops on touches of liquorice and smoked tea before it gets back to the more common mix of smokiness, lemon juice and seawater (a little salt). Perfectly balanced and highly drinkable, with a rather long finish on green tea, grapefruit and liquorice sticks. A totally flawless young Caol Ila just for our pleasure. 87 points. Caol Ila 8 yo ‘Unpeated Style’ (59.8%, OB, 12990 bottles, 2006) A much awaited official non-peaty Caol Ila, i.e ‘Highlands Caol Ila’ as the blenders call it. ‘Unpeated Style’ may mean that this one isn’t completely unpeated – let’s see… Colour: straw. Nose: spirity and very ‘alcoholic’ at first nosing, not unlike raw medicinal alcohol but the aromas are soon to come through. First both fresh and overripe apples, then a little milk chocolate, toasted bread and cappuccino, then a pleasant oakiness, then something grassy and faintly peaty (just touches, really), then lots of bourbon-style vanilla. It gets finally quite fruitier (gooseberries and green bananas, plantain) and frankly grassy, with whiffs of violets. Interesting to say the least. Mouth: very sweet, powerful but not pungent, starting on all kinds of lemon and orange sweets as well as a little tea and something rather ‘nervous’ (icing sugar, fructose). Goes on with notes of kiwi, fresh pineapple, angelica… Extremely ‘natural’, with little particular ‘markers’ and little wood (but I only had Highlands Caol Ila as a newmake before). Not quite sure one can talk about a particular style here, except that it’s very ‘clean’, very ‘simply fruity’ and very easy to drink with a little water. 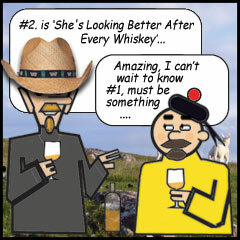 No peat that I can get on the palate – or maybe it’s this faint grassiness? Medium long finish on citrus fruits again, pineapples and maybe camomile and hints of marzipan. In short, the nose was a little more interesting than the palate, the whole being a rather simple but certainly not unpleasant malt – quite on the contrary. 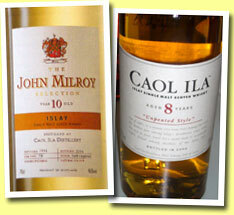 I hope we’ll be able to taste a much older ‘Unpeated Style’ Caol Ila one day. 83 points. 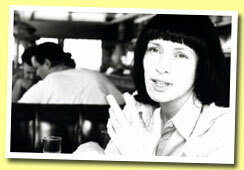 MUSIC – JAZZ - Recommended listening - The excellent Marianna Previti and Big Joe Maher sing VanHeusen's I thought about you.mp3 with the John Previti Quartet (John Previti is at the bass). Nicely crafted - please buy all these people's music! Talisker 30 yo (51.9%, OB, 3000 bottles, 2006) Colour: pale gold. Nose: very, very maritime and rather buttery at first nosing. Not very smoky (yet?) but we have lots of notes of kelp, seashells, fisherman’s nest, fresh almonds and a slight toastiness. As close as you can get to a plate of oysters with slices of buttered toast and fresh lemon, I’d say. It’s very elegant, very fresh and very clean, with something ‘sylphlike’. It gets then a little smokier and stonier, with whiffs of bonfire, flints, Riesling… Almost no pepper this time but I really love this profile that makes me think of Dagueneau’s Pouilly-fumés wines. Mouth: more flesh now, the attack being closer to the 20yo’s. The pepper’s well here, as well as quite some ‘dry’ fruits (mostly citrus, and small wild apples). A certain grassiness and an enjoyable bitterness (un-sugared green tee). Gets peatier with time and, curiously, a little sweeter at the same time (I get hints of ripe bananas but maybe that comes from the wood). And very salty! The finish is rather long, beautifully balanced and clean, with a very ‘coastal’ signature, lots of marzipan, a little liquorice and even more salt. I think it’s the finish that I like best here. Excellent and very interesting as most (all?) 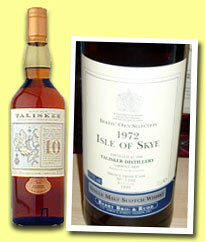 old indie Taliskers one can find are sherried versions. 91 points. Lagavulin 30 yo (52.6%, OB, 2340 bottles, 2006) Colour: pale gold. Nose: certainly bolder (maybe hotter and more spirity) and rather unusual, very different from what you’d expect from Lagavulin. Starts on rather bold notes of nutmeg, almonds, smoked tea, old books and maybe a little incense and starts developing on passion fruits, mangos, white currants and ripe peaches. Then we have a little mint, mint flavoured tea, peat smoke, liquorice tea, cigar box, hints of shoe polish… Finally apple skins, hints of ginger ale and old walnuts and we’re back to almonds (and a little coffee)… All that is rather subtle and I’d say it reminds me of the old 12yo. The fire’s gone but it left room for delicacy and subtlety. 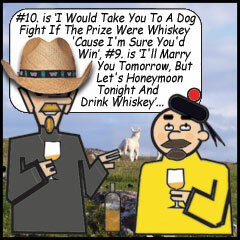 Mouth: just like with the Talisker, the palate seems to be bolder than the nose – and bolder than the Talisker’s. Also sweeter, fruitier and spicier, with lots of fresh nuts (macadamia spring to mind) and quite some lemon, grapefruit and liquorice stick. Grows bolder and peatier by the minute, with also a little ginger, cardamom, green, tea, apple skins… A fantastic development, from a maybe slightly shy start (considering it’s Lagavulin) to a bold, thick and extremely satisfying middle. The finish is long, almondy, peaty, smoky and salty (although a little less than the Talisker’s) and the whole is just a beautiful Lagavulin than doesn’t taste his age. I’d advise any taster to take his/her time with this one, it’s really the development that is fantastic – and I think this 30 yo has more to tell than the 25. Is that experience? 93 points. Brora 30 yo '5th Release' (55.7%, OB, 2130 bottles, 2006) Colour: pale gold. Nose: much more powerful and full of youth at first nosing, almost like if it would be 15 years younger. Rawer, rougher, starting mostly on huge farmy notes (wet hay, cow stable, wet dog), eucalyptus, wax, almonds, old books, wet cardboard, smoked tea, apple skin, walnuts… Well, the list is endless as expected. Gets even wilder after a moment (hare’s belly – having run on grass after the rain at 5 in the morning as some wine buffs would say -, civet, pheasant…) Hints of mint. Peatier than both the Talisker and the Lagavulin. Just amazing at 30 years, I guess there’s still quite some Brora from the early 70’s in the vatting. Mouth: bang! Rich, invading, thick, fat and almost oily, much more compact and ‘direct’ than both the Talisker and the Lagavulin. Truckloads of peat, apple skin, marzipan and liquorice, with a little vanilla in the background and also lots of quince jelly, strong smoked tea and spices (pepper, nutmeg, dried cardamom). Hints of horseradish and mustard. Amazingly punchy, I’m so glad I tasted the Talisker and the Lagavulin first. Very long finish of course, with again a little salt and quite some lemon skin, smoked tea and, of course, peat. Brilliantly compact, even if I feel the ‘2004’ version was maybe still a slight notch above this one. But let’s not split hairs, this is just what the doctor ordered! 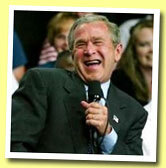 94 points, just like the ‘2005’. HUGE SUCCESS at WhiskyLive Paris that just happened last weekend. Together with Limburg's Whiskyfair in Germany, probably the best place to taste plenty of both brand new (hundreds) and now also antique whiskies and also to meet with lots of bottlers and managers - and a very classy and perfectly organized event, congrats Thierry, Martine, Jean-Marc and crew. I really hate to sound like I’m doing free publicity for anybody (paid would be even worse – yeah, yeah) but I’d say it’s really worth the trip to the City of Lights, even if you live in Ulan-Bator or Ushuaia. Next edition should take place in September 2007 (hint, hint)… See you there? Strathisla 27 yo 1976/2003 (46%, Cooper's Choice) Colour: pale gold. Nose: starts very perfumy and fresh, almost extravagant, with something musky. Old roses? Gewurztraminer? Lychees? Gets then a little more ‘classical’, mainly on vanilla crème, oriental pastries (flavoured with orange water), ripe plums… It gets then a little oaky and milky (lactones) but then we have more fresh fruits such as ripe apples, quite some bananas and Williams pears. A faint sourness (porridge, old walnuts) but the whole is pleasant. Quite a lot happening in this one, it seems. Mouth: very fruity again, on loads of cider apples, pineapple drops, lemon drops, canned pineapples… Slitghly sour but pleasantly so, even if the whole isn’t extraordinarily complex. Good mouth feel. Gets faintly cardboardy after a while but always quite fruity, with just a little wood behind the scene. Medium long finish, just as fruity as the rest. Not a Strathisla that will make you scratch your head but it’s all pleasure. 85 points. Strathisla 15 yo 1989/2004 (59.3%, OB, batch #SI 15002) Colour: pale gold. Nose: much more spirity, raw but closed, with just lactones and vanilla coming through plus a rather extreme grassiness. This one will need water! Let’s try: that works (quite), with more fruits (mostly golden delicious apples) but it’s still very, very simple, with little cask or age influence. Not bad at all but simple. Mouth (neat): extremely sweet and fruity, not unlike the Cooper’s, with lots of apples, fruit drops, oranges… Easier to drink than to nose at natural strength but let’s see if water will bring a little extra complexity: the answer is no, not really, it even got more sugary than fruity, with just a little liquorice and white pepper coming through. The finish is rather long and not ‘flawed’ at all but just as simple. I know some like this series from Chivas and of course it’s their right but I’m wondering why they picked such ‘simple’ and fairly ‘natural’ casks, while we all know that for instance Longmorn – or Strathisla, for that matter – can give us hugely complex and majestic whiskies. Now, don’t get me wrong, it’s still good whisky. 80 points. Hi, where do you live and what’s special there? I live (most weekdays) in Amsterdam, Holland – better known as ‘Sin City’ in the backwards woodlands of ‘De Veluwe’ where I grew up and spend most of my weekends. Well, the weekends when I’m not working on the MM/MM website ;-) What’s special about Amsterdam? Well, most tourists seem to focus on the coffeeshops and red light district but when you’ve lived here for 15 years it’s the quieter moments and spots that are nicest. My heart lies in the woods and that’s where I go to relax (and dream about making my own whisky there some day). Who or what made you discover whisky? Well, I think I’ve discovered ‘whisky’ in 1984 during a school trip to Canterbury – when I managed to slip away from my teacher’s supervision. 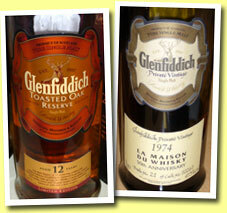 And if memory serves that was a Glenfiddich, so I started the right way; with single malts. Sadly, the rest of the 1980’s were squandered on blends like Teacher’s and Grant’s. It wasn’t until 1990 that I consciously sampled my first single malt whisky (a Lagavulin 16yo) at a café that was about to be demolished. You can read all the colourful details in the first entry of my Liquid Log on Malt Madness. Why do you like whisky? Not everybody may know this, but whisky actually contains small amounts of alcohol. And recent studies have shown that alcohol – when taken with moderation – is actually beneficial to your health. So, I put up with the taste and smell (and the occasional inebriation) because it’s good for me. Do you have a favourite distillery? Yes I have – but I should add that this changes with almost every new dram I sample. The thing that still fascinates me about single malts is the amazing variety in character and style. Focusing on just one distillery never made a lot of sense to me – you would be looking at just a small segment of the spectrum. 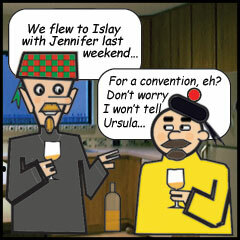 That being said, Ardbeg used to be a personal favourite for a long time. However, the recent ‘profiteering’ strategy under new owners Louis Vuitton / Moët Hennessy leaves a dirty taste in my mouth whenever I try any of their new overpriced bottlings. These days, depending on my moods, my love wanders mostly between Brora, Laphroaig, Talisker, Saint Magdalene, Braes of Glenlivet and Glengoyne – but that list could look very different again next year. Well, according to my Hit List that would be the Saint Magdalene 19 yo 1979/1998 from the ‘Rare Malts’ range. I’ve given that one my highest score ever so far (97 points) because, for me, it is ‘the ultimate malt’. All it needs is enough time and water, and it will show you all of Scotland, not just the Lowlands. Yes, it’s delicate (at 63.8% ABV!) and needs time, attention and care to fully blossom, but because of its versatility I’ve put it a notch above other favourites like the Ardbeg 25 yo 1975/2000 (50%, Douglas Laing OMC, 702 Bottles), the Springbank 12 yo 100 Proof (57.1%, OB via Samaroli) from the early 1980's and that glorious Bowmore 1965 (50%, OB, Bottled 1980's) you found when we stumbled into a pizzeria in Milan in 2002. What’s your best – or most vivid – memory regarding whisky? But OK, if I had to pick one highlight from the recent past it would be our tasting last year at the beach of ‘the Oa’ on Islay. Glorious scenery, glorious weather, glorious whiskies. Especially after trekking through so much old Islay history on the way there, that ‘old style’ Caol Ila tasted extra special indeed. Experiencing the moment with other maniacs made it all the more special. I remember, it was a 1969 by G&M. Now, is s there a specific bottling you’re looking for? No. These days I receive so many samples from fellow maniacs, readers of the website and ‘the industry’ that I have a hard time keeping up with it as it is. I do have a small ‘reserve stock’ but I’m not a collector. Since that reserve stock is already larger than it really should be I have to admit I rarely buy new bottles these days. If I do, I prefer to ‘go with the flow of the moment’ and pick the most interesting (yet affordable) bottles on the shelves of that particular liquorist. Are you a member of a whisky club and which one? Is that a trick question? 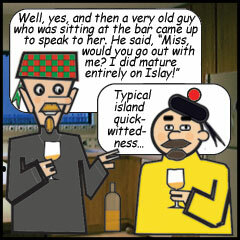 That depends on whether or not you consider Malt Maniacs a whisky club. If not, I’m afraid not. As you and the other maniacs have already found out I have my sociophobic episodes and I would hate the fact that I would ‘have’ to show up for club meetings. It’s different with the maniacs, of course. We have most of our discussions on-line and the rare occasions that we DO get to meet face-to-face are like little holidays from everyday life. Imagine you had a magic wand, what would you change in the whisky world? If I HAD a magic wand there would probably be other parts of the world I would try to change first, but let’s assume this is a specific ‘whisky wand’. Erm… Well, even then, SO many issues come to mind. Can I think about that for a while and put down my thoughts in a separate E-pistle? Well, sure but I didn’t want to open another Pandora box, eh! Now, have you been to Scotland? Oh, well, you don’t want me to change our ritual question just because it’s you, do you? So, what’s your favourite place there? Do you also, like us at Whiskyfun, like music? Which kind? Yes – or at least I used to. When I started Malt Madness in 1996 I still played rugby, was part of a chess club and published my own ‘Weird Planet Magazine’. I still have hobbies besides whiskies and Malt Madness / Malt Maniacs, but I have to admit that’s my main ‘hobby’ at the moment. Apart from that I enjoy movies, music, reading and writing. Is there another ‘liquid’ you like, apart from whisky? What’s your favourite expression of it? And I drink a lot of Pepsi Max to keep me up at night… Apart from that I like cognac, armagnac, calvados, some liqueurs, port and a few sherrys – well, the nose of some sherries at least. I’m not too fond of beer (except a few Belgian beers like Chimay Blue or Duvel) and I’m afraid you and Olivier haven’t converted me to wines yet either. I guess the subtler nuances just elude me. Believe me, I know many people who don't like water - not just Zaza my cat. Anything to add? 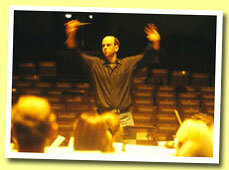 Thanks, Johannes, and thanks for you hard work on MM/MM! MUSIC – Recommended listening - More 60's inspired music with the very excellent Brendan Benson (aka 'the alternative to love' - eh?) doing What I'm looking for.mp3. Harmless but well done... 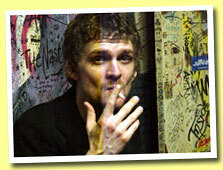 Please buy Brendan Benson's music. Tasliker 10 yo (45.8%, OB, circa 1990) Colour: gold. Nose: my first reaction is that it smells like an old Ardbeg. Not violent but hugely peaty and medicinal, with lots of iodine, oysters, bandages, camphor, even a little eucalyptus. All that settles down after a moment, the whisky getting sort of calmer, developing on overripe apples, black pepper, vanilla, a little cinnamon and, here we go again, ‘fresh’ seaweed. And also a little coffee… and more and more pepper. Excellent and with a little ‘bottle ageing’ (don’t shoot at me) it got almost perfect. Mouth: these apples try to make it onto your palate for a moment but it’s the peat that wins the first battle. Lots of it plus heavy liquorice, salt and pepper. Not exactly subtle but beautifully big. Well, it seems that the fruitiness (that does exist in the background) will never make it this time, as this Tasliker grows even saltier, more peppery as well, with also a faint minerality… And the finish is very long, always on peat – pepper – salt – liquorice… Superbly compact. 92 points. Isle of Skye 1972/1999 (42.5%, Berry Bros, cask #1102) Colour: deep amber. Nose: this one isn’t really comparable, it’s much older and more sherried hence fruitful. Less peaty and medicinal at first nosing but really expressive, superb, with stunning notes of cooked fruits topped with caramel and spices. Figs, passion fruits, papayas (something that reminds me of some Bowmores from the 60’s). The peat is well there, in the background, giving the whole a perfect structure. Keeps developing on bold notes of Havana cigars (a whole box), game, civet, shoe polish… gets slightly sweetish after that but it’s not a problem. Fab. Mouth: not really bold now, kind of slow to go into action and maybe a little tea-ish, sour and bittersweet. What a dreadful shame, the nose was so great! Rather nice peat but the sherry cask seems to have brought lots of dryness and probably a little rubber, even if the middle is quite weakish. Rather short, drying and sourish finish, with just lots of salt and quite some pepper as a final signature at the retro-olfaction. But what a fabulous nose it had! 85 points. 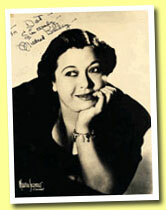 MUSIC – JAZZ - Recommended listening - She was one of the best and in 1936, Mildred Bailey was singing William Best's hit (I Love You) For sentimental reasons.mp3. Yes, before Nat King Cole. WARNING – Maybe you could read on a crazy blog by some crazy Belgians crazy news about me being a new member of a certain ‘society’ (ha!) Yes, that’s all crazy and, of course, wrong and I’ll post pictures that’ll explain why it couldn’t have been possible. Sorry, that was a bit elliptic (and crazy) but please stay tuned and you’ll get the whole picture in one day or two. Glen Grant 35 yo 1970/2005 (41.8%, Duncan Taylor ‘Lonach’) Colour: pale gold. Nose: a discreet attack on a little vanilla plus hints of fresh fruits (bananas). Goes on with notes of fresh walnuts, a little tea, apple skins and white pepper… Hints of oatcakes, hops and mashed potatoes… Quite shy and lacking a little more expression but certainly not unpleasant. Mouth: sweet and fruity like a much younger malt. Again, little personality but it’s not too woody – at all. Apple juice, vanilla crème, a little white pepper, tea… As simple as it can get at such old age but the consequence is ‘no weird taste’. It should be fun to let some friends taste this one blind and ask them how old it is. The finish is rather short but balanced, maybe slightly gingery (also a little cinnamon)… Again, shy but certainly not dead. 82 points. 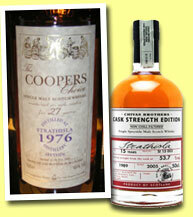 Speyside Selection No2 (51.7%, Duncan Taylor, 2005) A vatting of a bourbon cask from 1969 and a sherry cask from 1970. Colour: very dark amber. Nose: a hyper-sherried start on both cooked fruits (strawberries and blackcurrants) and coffee, with a rather perfect balance and no traces of rubber at first nosing. Quick to switch to old walnuts, like a fino or a vin jaune. Goes on with lots of toffee, reduced wine sauce, roasted raisins, a slight smokiness like often with these sherry monsters. Amazing that this one is a vatting of sherry and bourbon cask, I can’t see how it could have been even more sherried! But it’s excellent… Mouth: a hugely coffeeish and toffeeish attack, with also litres of old rum, Smyrna raisins, brownies… Slightly drying. Goes on with roasted nuts, bread crust… Hints of Turkish delights, orange liqueur (triple sec), dried herbs (thyme)… Very ‘classical’, with a rather long finish, ‘hyper-sherried’ and rather nicely dry. Very good in its style, even if, just like the ‘Lonach’, it lacks a little personality (while some may wonder which is Glen Grant’s ‘personality’) 89 points (typically a malt that can’t reach 90 or more in my books because of its slight lack of personality). Glen Grant 1970/2001 (55%, Berry Bros & Rudd, cask #1035) Colour: very dark amber. Nose: just as sherried as the ‘Speyside Selection’ at first nosing but probably with that extra-dimension brought by superb notes of smoke, coal, ham, wild mushrooms and flowers (the usual peonies). Also hints of Guinness… Other than that we do have coffee, toffee, raisins, cooked strawberries but a little less of that ‘fino’ character. In short, a rather masterly old sherry. And what a superb ‘rancio’! Mouth: just as excellent and very complex again right at first sip. Lots of caramel, all sorts of red fruits (both cooked and ripe but fresh), bananas flambéed, raisins (sultanas but also Corinth and Smyrna). Kind of a freshness that’s always welcome in these old sherry monsters… Even hints of tropical fruits (passion fruits, mangos). Also, should I say of course, roasted nuts, several kinds of fruit liqueurs, cake… And the finish is long, not rubbery, not bitter, not sour, not tannic (ok, ok) but just on the same kinds of aromas. Just excellent! 92 points. MUSIC – Recommended listening: it's Sunday, we go classical and greatest of news, after some serious vocal cords problems, Natalie Dessay is singing again! Today let's listen to her in Haendel's Tornami a vagheggiar.mp3 (from Alcina). Please, please... well, you know what to do. Want to feel young? 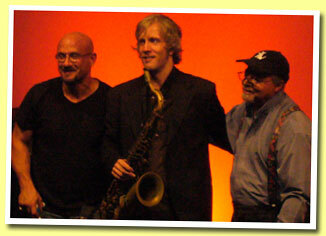 Easy, just go and see Jimmy Cobb live! That’s what I did the other night at Colmar Jazz Festival and believe me, the 77 years old drummer is like a walking dynamite stick. Glendullan 12 yo (43%, Flora and Fauna, circa 2003) Colour: white wine. Nose: starts fresh, fruitly and slightly oaky, as natural as it can get. Lots of freshly cut apples and gooseberries. A slight milkiness, hints of lilies of the valley… And not much else. Ah, yes, maybe hints of wet stones, flints… Rather clean and fresh but simple. A Scottish grappa? Mouth: it doesn’t lack body at all, with a liquoricy and malty attack and a rather long fruity development (apples again, not too ripe bananas). Even notes of bamboo shoots… Gets a little milky and buttery with time, with also a pleasant oakinesss… Thicker and richer than expected and with a long finish on malt, oatcake and apple skin, a tad dry. A pleasant surprise, again, very natural. 80 points. 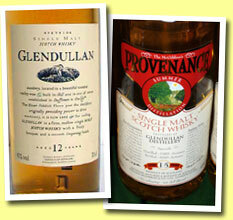 Glendullan 15 yo 1985/2000 (43%, McGibbons Provenance) Colour: wite wine. Nose: it’s roughly the same whisky, maybe a tad yeastier and milkier, with probably more wood (the extra three years I guess) and maybe a little less freshness. Certainly not less good than the OB. Mouth: now it’s quite different, more fruity and perfumy and less malty. Notes of ripe whitecurrants and Muscat, apples, Turkish delights, lemon fudge… Again something slightly drying in the background (grape seeds) from the wood and maybe a little salt… The finish is even longer than the ‘Flora’s’, more on grapefruit and apple skin, the whole being probably a little more expressive but slightly less clean. Same rating: 80 points. 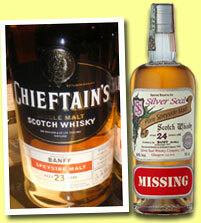 Banff 23 yo 1979/2002 (46%, Chieftain's Choice) Colour white wine. Nose: quite youthful, starting fresh and fruity with quite some apples and pears and a slight smokiness. Also canned pineapples and tangerines as well as a little vanilla, cake and cider, a little perfume (lilac). Seems quite harmless and rather gentle, balanced but without much personality. Hints of wood. Mouth: starts just as sweet and fruity, with quite some vanilla and ginger. Then we have something grassy and bitter, tannic, ‘green’ and the fruitiness disappears. Maybe just notes of old walnuts, grape seeds, mustard… Gets more and more ‘austere’. Finish rather long but raw and quite bitter, drying… Not flawed but rather hard to enjoy now… Really austere but lacking that ‘rectitude’ that could have saved it. 75 points. Operational: 1825 silent from 1929-67 but bonded warehouses and maltings continued to operate. Closed: In May 1983. License returned in 1992. Operational Owner: 17th December, 1997 United Distillers & Vintners Ltd, Diageo Plc. Port Ellen. 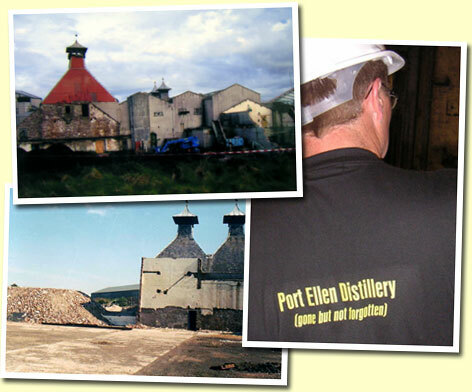 If there is one distillery that evokes strong emotions in the heart of the enthusiast it must be Port Ellen. As bottlings, official and unofficial become scarcer the angst only grows. Can’t they simply rebuild it? Possible but tragically, unlikely. This south shore of Islay distillery was originally founded by Alexander Ker Mackay with the support of the owner of Islay, Walter Frederick Campbell, M.P. of Shawfield & Islay. One source indicates that Port Ellen was actually a malt mill built in 1825 by Alexander Ker Mackay and was only converted to a distillery a few years later (2). Most other sources give the date of 1825 for the actual building of the distillery but this appears to be incorrect. The distillery’s original name was Leodamus “Leods Moss” but was renamed after Lady Eleanor/Ellinor Campbell, Port of Lady Eleanor/Ellinor, the wife of Walter Frederick Campbell (3). The water source was the Leorin Lochs just to the north of the distillery. Some time in the early 1830’s John Ramsay, who was to have such a positive impact on Port Ellen for the next 60 years, entered the scene. Over time Ramsay was to have extensive business dealings with Walter Frederick Campbell, the local laird. In the 1930’s the Distillers Company owned five Islay distilleries, Caol Ila, Lagavulin, Lochindaal, Malt Mill and Port Ellen. In the mid 1880’s Alfred Barnard visited Port Ellen, tape measure and letter of introduction at hand, and was conducted around the ‘works’ by the distiller, the manager being absent. He commented that the beach in front of the distillery was perfect for bathing and be ‘much appreciated and visited if there were some lodging houses or cottages available, and the place were nearer to Glasgow’. In particular Barnard took special note of three spacious barley lofts, three maltings floors (with steeps), two kilns with wire cloth floors, the Malt Store, the Mill Room containing a pair of malt rollers, the Mash Tun, a Wash Charger and heating tanks etc, etc. From there he moved onto the Tun Room which contained seven Fermenting backs and in the Still Room, two old Pot Stills with there also being present two receivers. Further he described Port Ellen as having six handsome warehouses containing 3,700 cask or 240,000 gallons of whisky of different ages and stated that Port Ellen had a capacity of producing 140,000 gallons of Islay Malt per year. Barnard made further note of the peats; that only the peats cut locally were used in the drying process and that the water derived from two lochs, one for distilling noted for ‘its clearness and purity’ and the other for driving machinery. The distillery also had it’s own cooperage and Seasoning House for casks, a fine Spirit Store and one of Morton’s Refrigerators (for cooling the wort). In 1966 & 7 the distillery was reopened and the number of stills was extended from two to four. The extensive re-build of the distillery involved improvements to the malt barns, steeps and kilns plus other improvements costing £400,000. Despite this investment in producing malt in 1973 the Port Ellen Maltings were completed. In May 1983 trucks ceased to deliver malt from next door to the distillery when SMD (Distillers Company) closed Port Ellen forever. 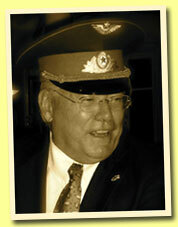 In 1992 the license was returned to the Excise. (2) The Island Whisky Trail by Neil Wilson & The Scotch Whisky Industry Record by H Charles Craig. (5) The Scotch Whisky Industry Record by H Charles Craig. 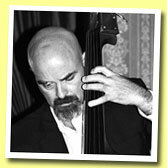 MUSIC – Recommended listening - Time for traditionals with Danny Knicely doing a St. Anne's Reel.mp3 that he makes swing, with Will Lee, on 'Murders, Drownings and Lost Loves' (where's whisky?) 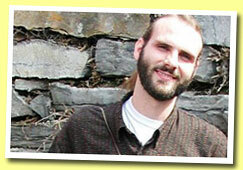 Please buy Danny Knicely's music - he's also a member of James Leva's Purgatory Mountain.